iOS and Android, Apps and Maps. The public release of iOS6 for iPhone and other iDevices has stirred a storm of protest about the failings of the new Apple Maps app, and a storm of indignation from the fanbois that anything Apple does could be anything short of perfect. Apple seems to have got itself into a sticky situation by ditching (or being ditched by) Google maps, but whoeover chose to break up the beautiful relationship, Cupertino’s hubris has met its nemesis in just blithely assuming they could throw together a good maps app, and rely on their tame press followers to drown out any complaints. This site has been a bit quiet recently, for the very good reason that I’ve been busy at work and at home. But it’s finally time to make some updates, not least because my old site platform Posterous will no doubt be going away after its acquisition by Twitter. So I’m moving over to the rather geeky but refreshingly text driven Octopress platform, which for the moment I’m hosting on heroku. That’s quite enough geeky buzz-platform name drops for one post, -Ed. I’m moving over whatever of my blog history that doesn’t seem too dated, and if you’re seeing this then I have almost certainly pointed http://isomaly.com over here already. I have a couple of new (customer) projects that I will be embarking on in the coming months, but they are the sort of thing that I can blog about later on. I bought an N7 to serve as a combination of my primary Android development testbed, and to see what a 7” tablet feels like in use, without spending a fortune. I went for 16GB because there’s no potential to add an SD card. Coding Is the New Latin ? BBC Technology , and with it the interwebs, has been buzzing with the realisation that Computer Science Education in English Schools is woeful, and that while in Scotland we have got as far as recognizing some of the deficiencies (see Ewan Macintosh and The Curriculum for Excellence) things are still far from rosy even north of the border. I profess to ignorance of the situation in Wales and NI. The NESTA Next Gen report recognizes that Computer Science is intellectually fundamental, but spoils its point by focusing on arguing for very vocational “industry relevant” “specialist training”. In other words, it argues as a special interest group asking for public support to make its life easier. So I’ve run across a couple of problems with XCode 4 that others may possibly care about. 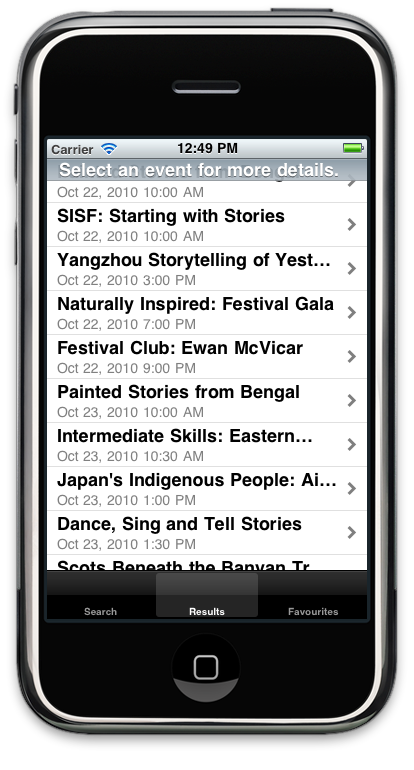 The conversion process of a project would appear to turn off “Application requires iPhone environment” in the .plist file. With the result that you get told that embedded.mobileprovision already exists, when you attempt to copy an ad hoc distribution .app file to itunes. You need to re-enable that. It’s funny to see the term app having entered the general lexicon. The first thing that happens is that it loses any precise meaning. So I will try to dig into it along several axes. From a purely technical point of view, an app is a piece of software explicitly installed on a mobile phone, usually because the user has found it in a, or the, store. There’s lots of things here. We’re very happy to see that CycleStreets, and the app which we wrote for them, was featured on the front page of the official UK Government open data site. It’s a pity they’ve got a little confused between the CycleStreets website and the iPhone app. But all publicity is good publicity. My son was invited to a party in a part of the world we don’t know well, with instructions that the house (newly built last summer) was “not on the map.” Not on Google Maps, it wasn’t, but I tapped the address into the namefinder on my CycleStreets app, and the OSM-backed namefinder found it. Cue a stress free trip to party. So my thanks to whoever surveyed new parts of Bonnyrigg recently, and once again to all the great folks who contribute to OSM. It’s an example of great technology which makes life that little bit easier. 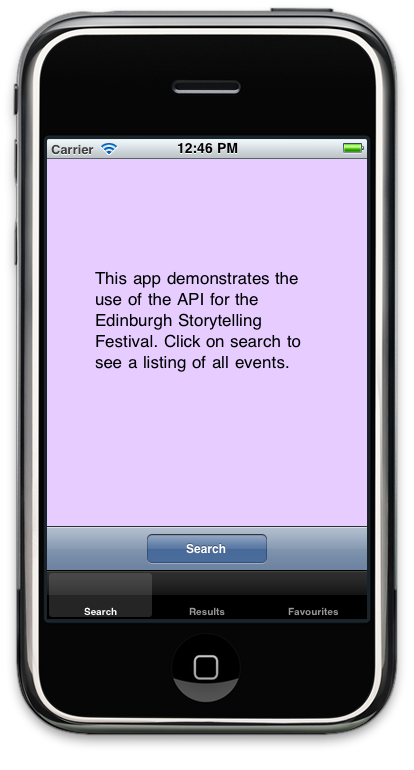 The Edinburgh Festivals Innovation lab built a little API round the listings for the forthcoming Storytelling Festival. 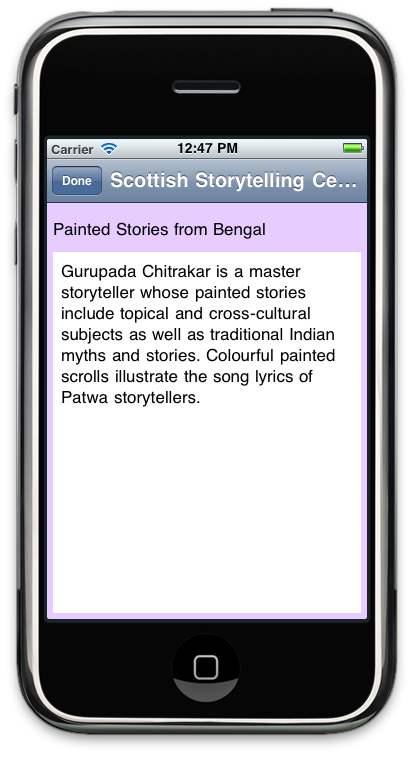 So for a wee bit of fun, I have written a demo app around it. I’ve provided a few screenshots. It is an extremely plain and simple interpretation of the listings, but for 3 hours work it does show that you can have something usable without too much work. Of course in the iPhone world, visual artifice is a given, and to release such an app to the app store would require quadrupling the development time with some design-y touches.